We have 13 Masters which means there will be a Top 2 cut. I start Machop and Eevee. He goes first, attaches to a lone Manetric and Roars out my Eevee. I collector for two Uxies and an Unown Q. I get the Fighting Energy and Rare Candy via the first Uxie “Set Up.” I fill my bench to maximize the second Set Up. I get to a Premier Ball, use it to search for Uxie Lv.X, then use Pokémon Communication and throw it back in for Machamp for the Take Out donk. Start lone Ditto, but it doesn’t stay ugly for long. I Collector ASAP for Unown Q, Uxie, and Machop. Using this I get started and get a Machamp up for a quick KO. He recovers decently to a Charizard. He appears to be sputtering though and gets a KO on a Machamp. I don’t have many more options next turn, and put 20 on Charizard with another Machamp. He is only able to get 50 on my Machamp next turn, and appears to not have a Supporter. I go to Hurricane Punch, and flip 4 heads, putting him within 20 of the KO. He can’t KO the Champ next turn, and I Take Out for the KO on the Charizard. From there I use Rage on a Typhlosion, and start sweeping with Rage and Take Out for the 5-0 win. 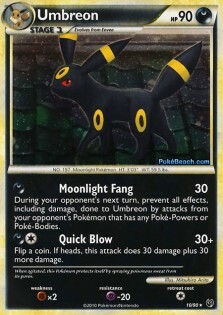 I think Umbreon would have helped in the matchup if I wouldn’t have been able to sweep. I could have Moonlight Fanged Charizards and Typhlosions and done alright. This game is a little blurry. I know I take the first prize, but after that I keep misplaying into his Banette tech. He’s able to wall enough with Banettes to keep me at bay. He’s slowing me down while building up his benched Machamps for Rage and Strong Willed. Time is called on his turn… I’m losing 3-2. On turn 3 (mine) I tie it to 2-2, but there’s no way I can tie it without him being able to return the KO. He starts Ambipom G, attaches an Energy and passes. I dump a good bit of my hand (started with active Machop) and use Set Up. I get to a BTS and a Fighting Energy. I evolve Machop into Machoke and use another Set Up. 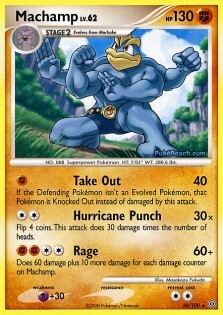 I whiff on the Machamp, and can still donk if I flip a heads on Steady Punch… and I do, for the win. He starts with his lone tech Sableye… and no other basics, so he Impersonates a Collector. I start with Machop, and show him: Azelf, Bebe’s Search, Rare Candy, and Fighting Energy for the guaranteed donk. He picks me to go first. My starting 7… Unown Q, Eevee, Rare Candy, Rare Candy, Broken Time-Space, Fighting, Super Scoop Up… top deck… Pokémon Rescue. I attach to Eevee, and use Call for Family for my Chatot. His start is weak as well, allowing me to get off a key Mimic. I am able to get a prize advantage, and he continues to use Professor Oak’s New Theory and Copycat to refresh his hand, but is drawing crap. I get a key heads on a Strong Willed flip mid-game. He scoops when I’m up 4-2, and show a Pokémon Rescue for Machamp Lv X. And again those are ALL the Machamps in the field too. 4 Champs, 4 SP, 5 Others. Unfortunately, the problem with Champ is the short Tournament Report… kind of lame, but thanks for reading! I’m curious about your deck list and can’t find it anywhere on the forums. Link? Anyway, well done! so many machamps its scary. Wow. Did not realize the entire T4 was Machamps.. That’s gotta be some kind of season record. That was a fun tourney. 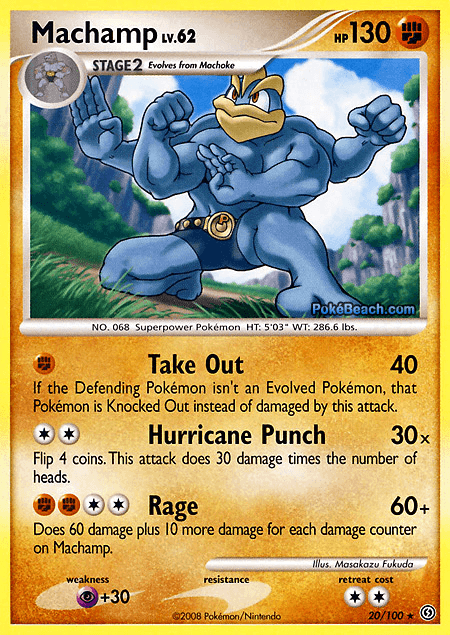 lol yea I’d imagine in a machamp dominated area that sp decks would be dangerous. It’s kinda fun to see a T4 list that isn’t full of gengar and luxchomp. 1/1 is the best way to go. This card isn’t a saving grace like a lot of people think. Any skilled player can play around it, making 2/2 just more dead cards. The only think it is useful in is against scrubs or stage 1/2 decks that are already set up and their entire field has powers or bodies. Congrats man. 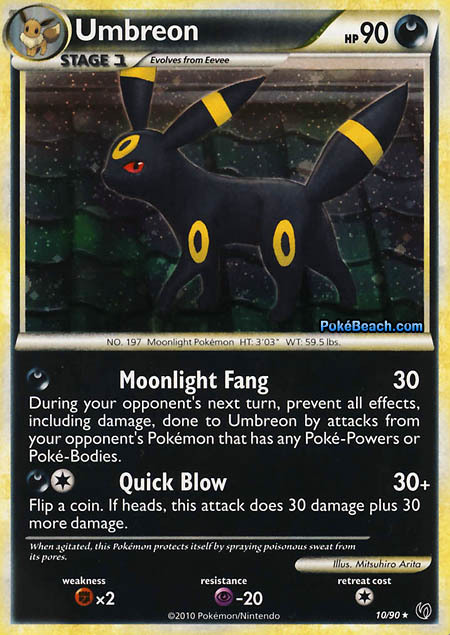 I lost to a Machamp and an Umbreon deck in one day, lol.